"RAU Hyaluronic Ampoule" contains highly-concentrated hyaluronic acid, which helps your skin retain an extensive amount of moisture and creates an instant plumping effect. Rootbeet, betaine and natural corn starch provide your skin with moisture , and at the same time prevent deydration. In addition to this, it has an antioxidative effect and reduces skin irritations. Panthenol acts calming, anti-inflammatory, moisturising and boosts skin cell renewal. This special active ingredient complex improves skin elasticity and strengthens barrier function. It reduces the depth of wrinkles and lines, your skin becomes plumper and firmer. Apply to cleansed skin and gently tap in with your palms. Afterwards, you can apply your usual skin care product. 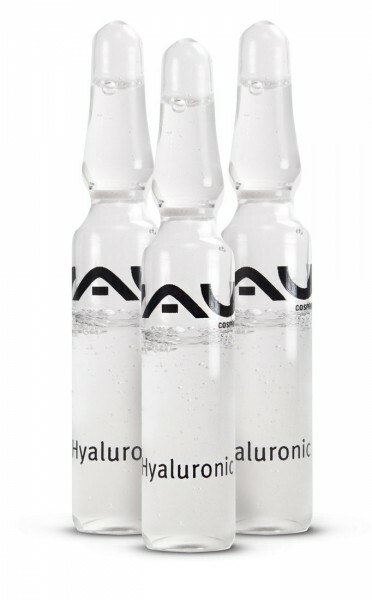 Related links to "RAU Hyaluron Ampoule 3x2 ml"
Customer evaluation for "RAU Hyaluron Ampoule 3x2 ml"